But it turns out I may have been too nice in my analysis. As reported by USA Today, independent researchers have discovered that Social Security is even more bankrupt than suggested by official estimates. New studies from Harvard and Dartmouth researchers find that the SSA’s actuarial forecasts have been consistently overstating the financial health of the program’s trust funds since 2000. “These biases are getting bigger and they are substantial,” said Gary King, co-author of the studies and director of Harvard’s Institute for Quantitative Social Science. 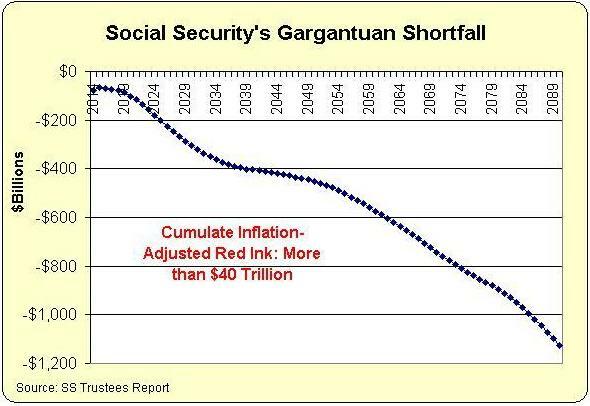 “[Social Security] is going to be insolvent before everyone thinks.” …Once the trust funds are drained, annual revenues from payroll tax would be projected to cover only three-quarters of scheduled Social Security benefits through 2088. By the way, I’m not overly enamored with this analysis since it is based on the assumption that the Social Security Trust Fund is real when it’s really nothing but a collection of IOUs. But if you don’t believe me, perhaps you’ll believe the Clinton Administration, which admitted back in 1999 (see page 337) that the Trust Fund is just a bookkeeping gimmick. In other words, what really matters is that Social Security spending is climbing too fast and consuming an ever-larger share of economic output. That means – in the absence of reform – that more and more money will be diverted from the economy’s productive sector, in the form of taxes or borrowing, to finance benefits. And when I write “more and more money,” that’s not a throwaway statement. Returning to the USA Today report, academic experts warn that the long-term shortfall in the program is understated because it is based on 75-year estimates even though the program doesn’t have an expiration date. At the risk of being pedantic, I’m also not enamored with either approach mentioned in the above passage. Sure, we should acknowledge all expenses and not arbitrarily assume the program disappears after 75 years, but the approach used to calculate “unfunded liabilities” is artificial since it is based on how much money would need to be invested today to finance future promised benefits (whether for 75 years or forever). Needless to say, governments don’t budget by setting aside trillions of dollars to meet future expenses. Social Security, like other programs, is funded on a pay-as-you-go basis. That’s why the most appropriate way to measure the shortfall is to take all projected future deficits, adjust them for inflation, and calculate the total. When you do that, the Social Security shortfall is a staggering $40 trillion. And that’s based on just a 75-year estimate, so the real number is much higher. Though keep in mind that this is just an estimate of the fiscal shortfall. What really matters is the total level of spending, not how much is financed with red ink. Which is why the only real answer is genuine reform. For further information, here’s the video I narrated for the Center for Freedom and Prosperity on the need to modernize the system with personal retirement accounts. But if you prefer to trust politicians, you can always support the left’s favored solution. P.P.S. The “Trust Fund” is real only in the sense that the government’s legal authority to pay benefits will be constrained when the IOUs are used up. That’s why the USA Today article says that the government at that point would be able to pay only about 3/4ths of promised benefits (though one imagines that future politicians will simply override that technical provision and require full payments). P.P.P.S. Many nations have adopted genuine reform based on private retirement savings, including Australia, Sweden, the Faroe Islands, Chile, and The Netherlands. P.P.P.P.S. Because of lower life expectancies, African-Americans are very disadvantaged by the Social Security system. A system of personal accounts presumably wouldn’t help them live longer, but at least they would have a nest egg to pass on to their kids. Hopeless. Popular government based on blind allegiance to faulty management of public finance, is not inclined to listen to logic and reform. It may require a financial debacle to gain attention – like a 2 by 4 to a mule’s head – to get its attention. Addiction to a poorly engineered program, casually – even badly managed – has to go ‘cold turkey’ to wean itself from dependence from an entitlement fashioned by the ancient gods of Roosevelt and Bismarck. If the truth be known, the People – collectively – are lemming-like. At best, they are victims of the herders of opinion, e.g., the media and other satraps of politicians . While I agree that private savings accounts would be much better than the current system, it is important to recognize that future Social Security payments have net zero impact on the US. Within the US there will be significant disruptions caused by the transfer of funds from the productive to the no longer productive. This will re-focus productive activities toward the non-productive, in order to get that money back. These are productive resources that may have been better allocated elsewhere. The point is that “future SS liabilities of $40 trillion” has little meaning unless you recognize that US citizens will receive an equal $40 trillion in benefits. In ’73 was talking with Bob LeFevre who pointed out the SS ponzi scheme and predicted it wouldn’t last to the turn of the century. He was right, running as it was at the time, but tinkering has extended it at least through today. Seniors aren’t concerned about 2088. Total spending is the issue. Someday it will create some very bad times, but someday we will all be dead. It will not be fixed until it is un-fixable. I wish it were possible Dan to edit these comments. Follows is adescription of what was received when I dictated into the machine. There’s only a small resemblance between what I said and what was received but the general tanner is accurate.then, many thanks for your insightful and accurate portrayal of Social Security problem. There are solutions. But I can appreciate your illuminating the gap that’s out there to be covered. But I wish you would para way from your discussion disrespectful and demonizing language like clownish Elizabeth Warren and other belittling and dehumanizing references. It attracts from the rigid liquor and value of your analysis. These people honest by and large on a stand well-meaning individuals trying to engage on issues of major national importance like the gap between how some of us live and others struggling to survive. Not only that but Elizabeth Warren for example comes from the same school as you reference in your analysis of the social security problem. can anything good come out of Nineveh I think so butwe really do need to clean up the dialogue and.